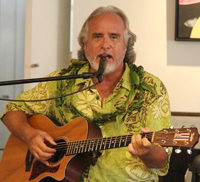 Ken Emerson is one of the world’s most highly regarded traditional Hawaiian slack key & steel guitarists living today. He is a monster player of both and he switches easily between them during his performances, laying his guitar on his lap and picking up a steel bar for an instrumental interlude. Emerson is famous for his one-of-a-kind slack/steel style playing of vintage acoustic steel bodied National Resonator guitars.